What a sad week. More than usual I've been thinking about, and grateful for, teachers. Looking for a distraction from the news out of Connecticut, I read about the role teachers have played in space exploration. So, if you're looking for a distraction too, that's what this post is about. 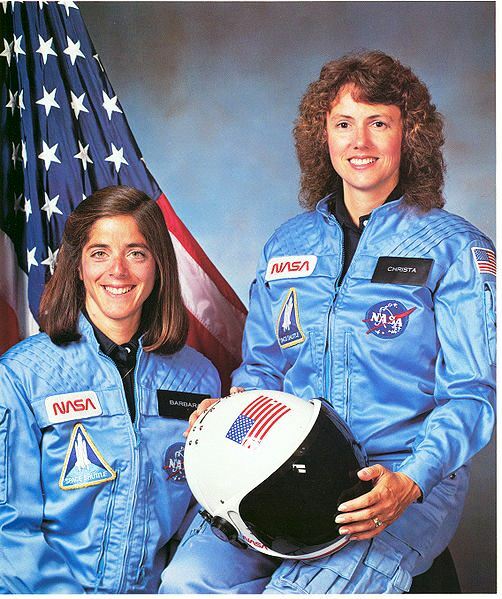 Teachers in Space: Barbara Morgan and Christa McAuliffe. Neil Armstrong returned home from the moon to teach at the University of Cincinnati, and there are many other examples of college professor astronauts in the years since he walked on the moon. But, today's post explores the history of primary school teachers in space ... aside from their obvious, fundamental role: laying the foundation of math and science education necessary to become a rocket scientist or astronomer or an astronaut! NASA announced its first Teacher in Space project in 1984, to build enthusiasm for space exploration, math, and science among U.S. students. Over 11,400(!) teachers applied to be picked as citizen astronauts in NASA's Teacher in Space program, and two women were chosen. Christa McAuliffe, who launched and died aboard Challenger's last mission, and her backup, Barbara Morgan. 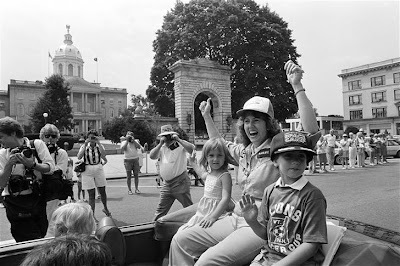 In pretty much every single photo of Christa McAuliffe I came across while researching this post, she's got a huge grin on her face. It's obvious how excited she was to be picked for the Challenger mission. Christa was a high school history teacher when she was selected in 1985. It's interesting that she wasn't a math or science teacher, isn't it? It sounds like she was picked based on her character more than her background. According to NASA administrators and her former students, Christa's enthusiasm for learning rubbed off on everyone she encountered. As a history teacher, Christa had a unique view of space exploration: "I think just opening up the door, having this ordinary person fly, says a lot for the future ... you can always equate astronauts with explorers who were subsidized. Now you are getting someone going just to observe. And then you'll have the settlers, the space station is not too far down the road." Christa with her son and daughter, July 1985. 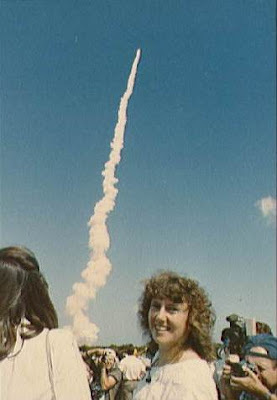 As the first private citizen in space, Christa planned to document her trip aboard Challenger with daily journal entries, so that "like a woman on the Conestoga wagon pioneering west, I too would be able to bring back my thoughts and my journal to make that a part of history." And, if she had lived to make it into orbit, the plan was for Christa to teach classes of school kids live via TV from outer space. Christa McAuliffe in an astronaut jet trainer. Christa believed that her space flight would be safe. She told a reporter in 1985 that the "space shuttle isn't the type of thing, I think, that anybody really looks at with fear that there's going to be an accident ... I feel, probably, safer doing something like that than driving around the New York streets." Christa's life insurance company had some doubts, though. It cancelled her policy after she was selected to fly. She was only insured when she died because a private aerospace company donated a $1 million dollar policy before her flight. Others at NASA shared Christa's belief that space travel had become routine and safe. History of course tells a different story: that sense of complacency, along with bureaucratic bungling and a bad decision to launch, killed all seven Challenger astronauts on January 28, 1986. 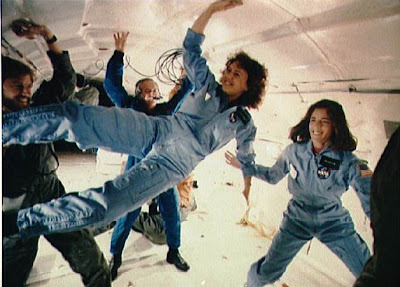 Christa McAuliffe training for microgravity in a KC-135. What became of the other NASA Teacher in Space participant, Barbara Morgan? Barbara left NASA a few months after Christa died, returning home to teach second and third grade in Idaho. But, she was not done with outer space! 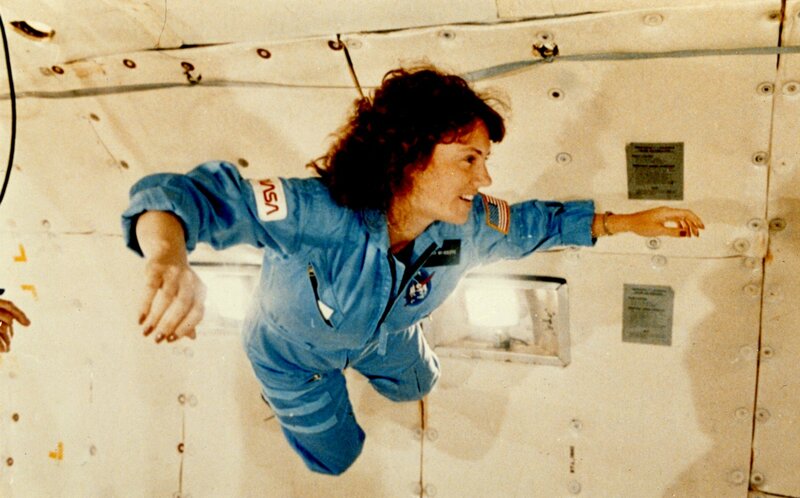 Over a decade after the Challenger tragedy, Barbara was selected to serve as a NASA Mission Specialist. She began training for a space mission, just like any other astronaut candidate. For several years, she served as CAPCOM, communicating with space crews from Mission Control in Houston. 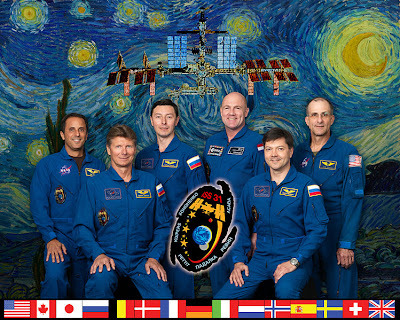 Barbara flew in space once, on a mission to the International Space Station in 2007. Her primary tasks were operating the shuttle's robotic arm, and overseeing the transfer of supplies between the shuttle and the ISS. In orbit, she also took questions from students in Idaho and at the Challenger Center for Space Science Education. Barbara Morgan, a teacher in space. The Teacher in Space program was cancelled a few years after Christa died, but other primary school teachers have flown as educators in space in the years since, as part of subsequent NASA Educator in Space initiatives. These include Dorothy Metcalf-Lindenburger, who was a Washington science teacher when she was selected as an astronaut candidate in 2004. 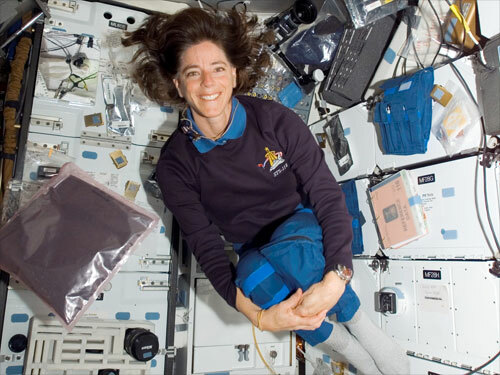 In 2010, she became the first Space Camp alumna to fly in space. :-) Other teacher astronauts include Richard Arnold, a high school science teacher who flew to the International Space Station in 2009, and Joe Acaba, the first Puerto Rican astronaut and the first middle school teacher in space. 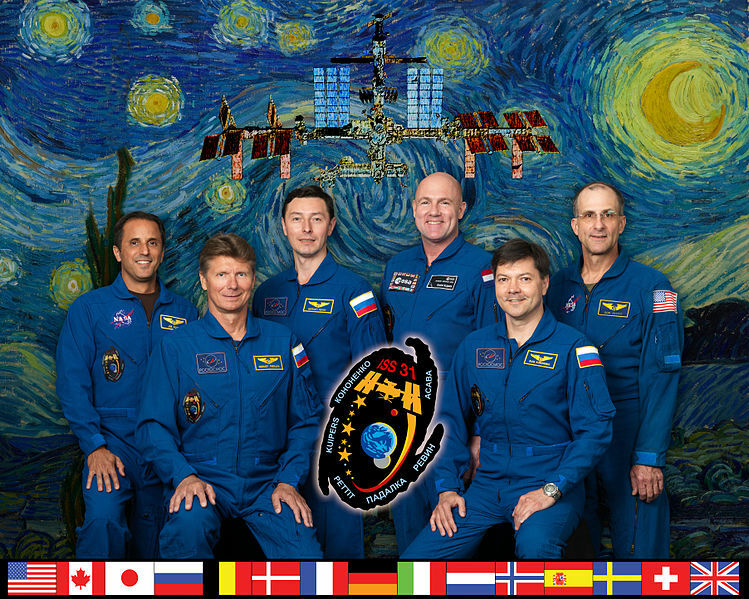 He has flown several missions to the ISS, including one this year. 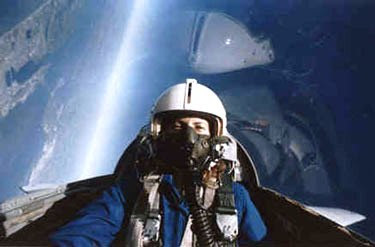 One of Joe Acaba's mission photographs (Expedition 31). So in a way, Christa was right after all. She was a pioneer. Others followed after her, and they traveled to a space station. It just didn't work out quite the way I wish it had. Christa McAuliffe and Barbara Morgan watch the Space Shuttle Challenger launch in October 1985. United Way has set up a fund for victims' families. As always, the Red Cross is helping out in Newtown. If you support restoring the assault rifle ban and limiting access to guns by mentally ill folks, you can support the Coalition to Stop Gun Violence. And, there's the Brady Campaign to Prevent Gun Violence named for former assistant to President Reagan James Brady. Sources: NASA; New York Times; Los Angeles Times; Washington Post; Wikipedia; Educationworld.com; Christa McAuliffe: Reach for the Stars. 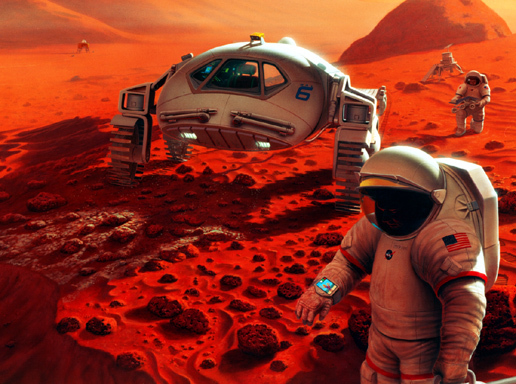 There are many, many, many obstacles to establishing a human colony on Mars. One huge challenge is the cost of ferrying people and the supplies they'll need between the two planets. Another challenge is the length of the trip to Mars. It took four days for Dr. Aldrin to travel from the Earth to the moon; it took the Curiosity Rover nine months to travel from the Earth to Mars. Mars Science Laboratory, on its way to the red planet. Dr. Aldrin's "Mars cycler" plan comes in handy in addressing both of these challenges. Dr. Aldrin formulated this plan in the mid-1980s. He called for the establishment of a permanent human base on Mars, supplied by a fleet of of uniquely tasked spaceships. Some of these spacecraft would be used to ferry people and supplies between the surface of Earth and Earth orbit; some would transport people and supplies between the surface of Mars and Mars orbit. Meanwhile, traveling between Mars and Earth there would be a continuous cycle of interplanetary spacecraft: "cyclers." These cyclers would essentially be space stations orbiting a path that would take them between Earth and Mars every few months. They'd be similar to the international space station, but with heavy-duty rockets attached, more radiation shielding, and maybe a big centrifuge creating artificial gravity. You could have two of these cyclers, with one always going towards Earth and one away. 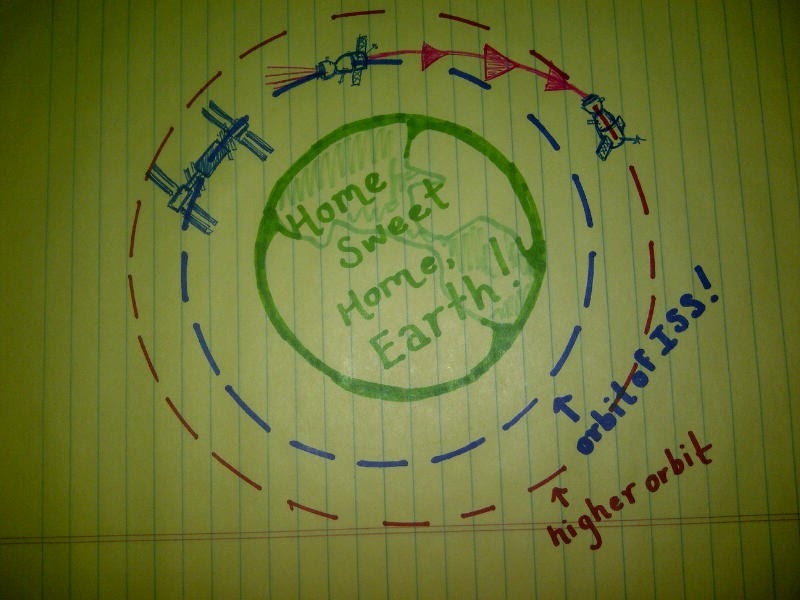 Or you could launch even more cyclers, allowing for more frequent trips between the two planets. A Mars cycler approaches Mars. Source: Scientific American, March 2000. One upside to the cycler is that it makes a faster trip to Mars than traditional spaceships. In contrast to Curiosity's nine month trip to Mars, the cyclers could make the same trip in just five months. Cyclers are faster because they take advantage of a gravity assist. Meaning, they are aimed for a close encounter with Earth and then Mars, hurtling around each planet before shooting out back towards the direction they came from, picking up a bit of the planet's momentum as they go. 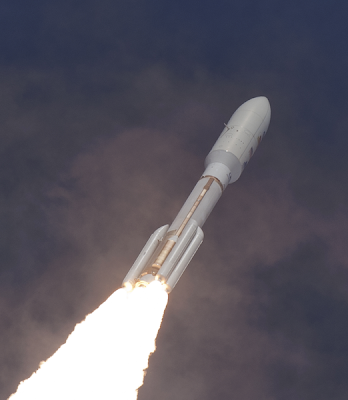 Gravity assisted spacecraft (like the Voyager spacecraft) can build up much higher speeds than just firing a rocket. Voyager 1 gained the momentum needed to escape the Sun's gravity via a gravity assist from Jupiter and Saturn. The cyclers have other advantages. You don't have to pay for the fuel to repeatedly accelerate or decelerate the spacecraft when they reach Earth or at Mars, and you aren't constantly building giant spaceships capable of leaving Earth's atmosphere and landing on Mars. In these multi-stage spacecraft, almost every stage gets discarded after accelerating and decelerating between Earth and Mars. 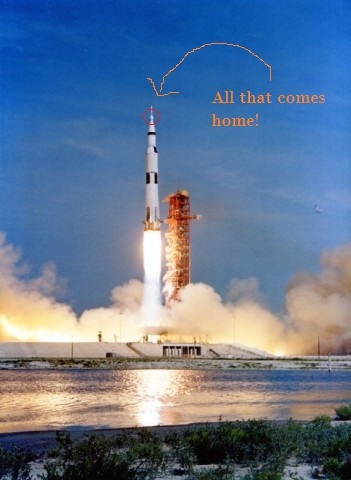 The little bitty command module, that I've circled in red, is the only bit of Apollo 11 that made it home to Earth. Are there downsides to the Mars cycler? Yes... maintaining the Mars-Earth orbit requires more than just the occasional course correction boost that the International Space Station gets to maintain its Earth orbit. As Dr. Aldrin acknowledges, "moderately large" maneuvers are required at irregular intervals to keep cyclers from smashing into a planet or zipping out of orbit into empty space. But, that said, the cycler is still essentially an orbiting space station: it is not having to expend massive amount of propellant to escape Earth or Mars gravity every time it flies to those planets. Another problem is actually reaching the cycler from vehicles launching from Earth or Mars. The launch craft must catch up as the cyclers make their once-every-five-months pass by the Earth or Mars. The cycler could be travelling as fast as 27,000 miles per hour as it encounters Mars. That's close to the fastest speeds that the Apollo spacecraft ever traveled. So, a rocket leaving Mars attempting to rendezvous with the cycler would expend a great deal of energy. 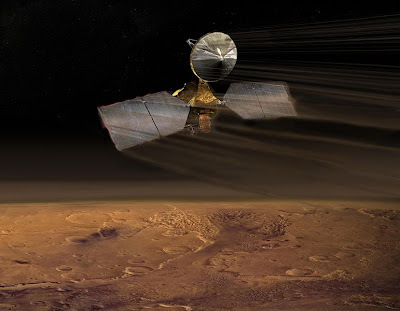 Or, alternatively, you could significantly slow down the cycler when it reaches Mars (by aerobraking- dipping into and out of the Martian atmosphere, with the friction of Martian air slowing the craft down). Then, it would be easy for a spaceship leaving Mars to rendezvous with the slowed cycler... though the cycler would need a big rocket boost to speed up and travel back to Earth. An illustration of Mars Reconnaissance Orbiter aerobraking on arrival to Mars. Will humans ever hitch a trip to Mars on a cycling interplanetary space station? Nearly thirty years after he first proposed it, Dr. Aldrin's cycler idea still seems like a doable approach to establishing a long-term human presence on Mars. So, whether Mars Cyclers come to pass probably depends on our dedication to exploring the solar system. Sources: Next Big Future; March 2000 Scientific American; buzzaldrin.com; NASA; D.V. Burnes, J.M. Longuski; B. Aldrin, Cycler Orbit Between Earth and Mars, Journal of Spacecraft and Rockets (1993); Buzz Aldrin et al. 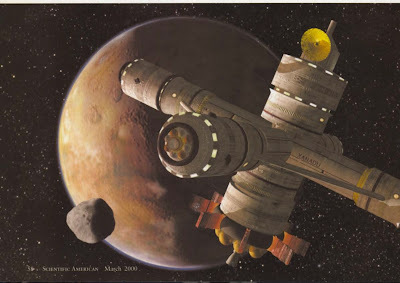 ; Evolutionary Space Transportation Plan for Mars Cycling Concepts. "In the hopes that this work may in some way contribute to their exploration of space, this is dedicated to the crew members of this country's present and future manned space programs. If only I could join them in their exciting endeavors!" Dr. Buzz Aldrin, after his stroll on the moon. Dr. Buzz Aldrin goes down in history as the second man to walk on the moon. He was also the first PhD in space. He submitted his thesis in January of 1963; he was selected as an astronaut in October of that year. * Dr. Aldrin's dramatic and sometimes troubled life story (Dancing with the Stars, three divorces, alcoholism, etc...) sometimes seems to overshadow his scientific accomplishments. But, before walking on the moon, he was the first person on Earth to earn a doctorate in the field of astronautics. MIT actually created its astronautics program specifically for him! *: Astronaut Jim McDivitt was awarded an honorary doctorate before he flew on Apollo 9, but Aldrin was the first astronaut hired with a ScD (equivalent to a PhD) degree. 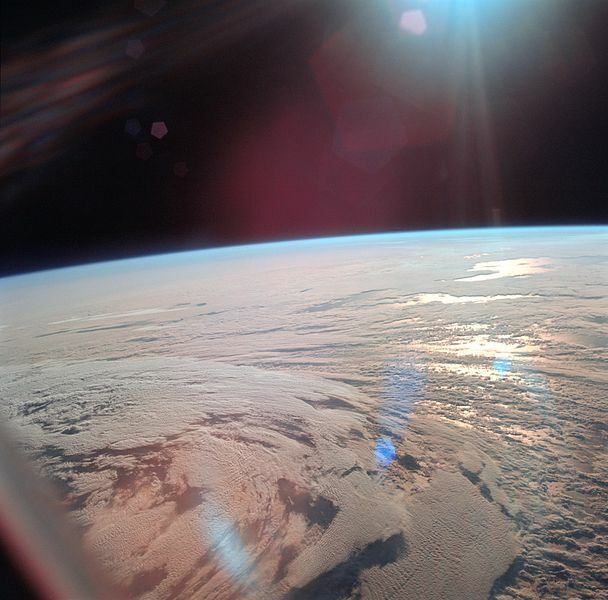 The view from Apollo 11, leaving Earth orbit for the moon. Astronautics is the study of space navigation. Dr. Aldrin's research focused on the process of docking two orbiting spacecraft. 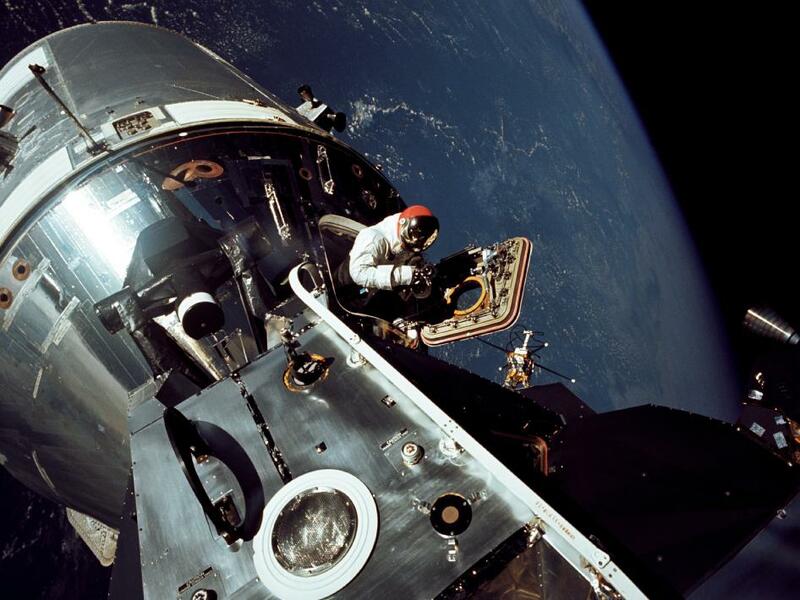 When Dr. Aldrin was completing his coursework, humans hadn't yet docked two spacecraft in orbit. 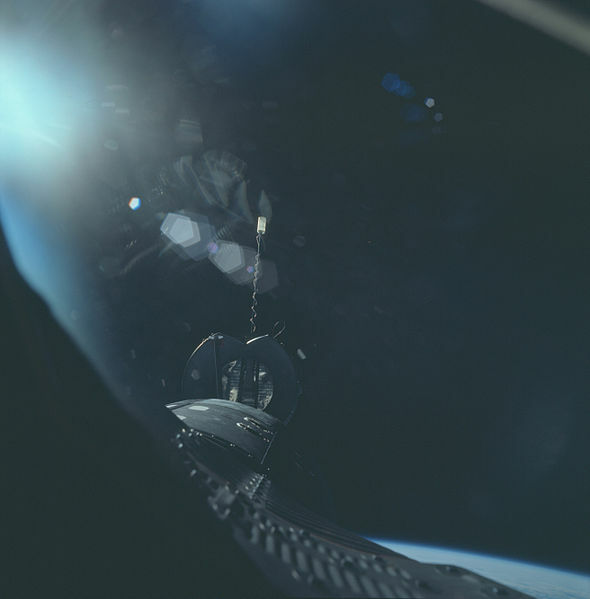 The first docking occurred on Gemini 8, in 1966. Soon thereafter, Dr. Aldrin flew aboard Gemini 12 and was able to follow up on his doctoral work with hands-on experience. 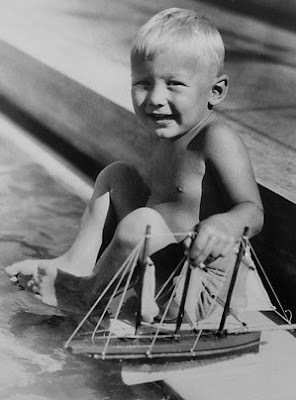 Dr. Aldrin in his pre-PhD days. Dr. Aldrin's thesis was titled Line-of-Sight Guidance Techniques for Manned Orbital Rendezvous. It's available for download here. His doctoral work was the development a procedure for visually docking (as in, using your eyes to guide the spacecraft). That way, astronauts would be able to supplement computer models, navigational chart data, or radar data with their own visual observations. Being able to rely on a visual docking technique in addition to following computer and instrument guidance means that docking is possible even if those sources of data partially failed. So, for example, when the rendezvous radar failed during Dr. Aldrin's Gemini 12 mission, he and Jim Lovell docked their spacecraft to the target vehicle using the onboard computer, navigational charts, and their own observations out the spaceship windows. 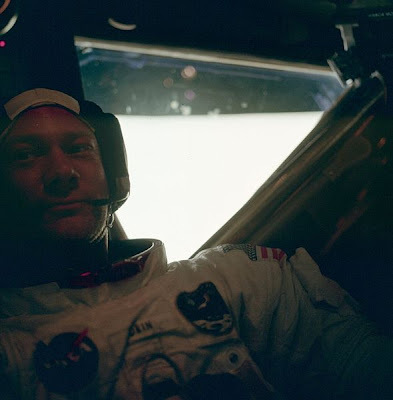 Such was the success of Dr. Aldrin's visual docking techniques that parts of the dissertation became standard operating procedure for NASA. The view from the Apollo 11 Command Module: the Lunar Module approaches. Docking spacecraft in orbit poses serious challenges not encountered when docking a boat or connecting two aircraft for a refueling maneuver Like air travel, space travel works in three dimensions. But unlike air travel, there's the added challenge of working with craft that are in orbit. There's also the confusion created by freefalling around Earth without a feeling of "up" or "down." 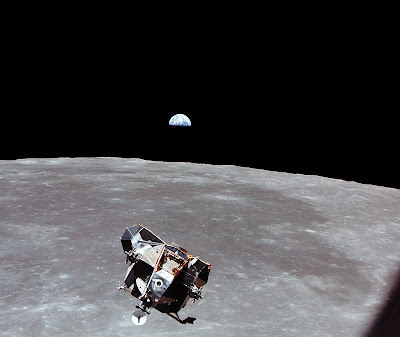 And, there's what Dr. Aldrin terms an "orbital paradox." 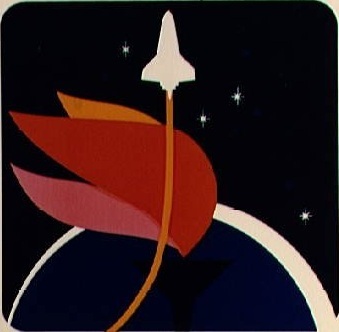 Here's the paradox: If you're trying to pilot your orbiting spaceship to reach a spaceship in a higher orbit, the intuitive course is to (1) aim your spacecraft up, towards the higher orbit, and (2) speed up your spacecraft so it will catch up. Dr. Aldrin describes the surprising result of this maneuver. You'll "end up in an even higher orbit, traveling at a slower speed and watching the second craft fly off into the distance." Gemini 12 and an Agena Rocket, 15 feet apart. Or, as Neal Stephenson describes it in his novel Anathem: "Things in orbit didn't behave like we were used to. Just to name one example: if I were pursing another object in the same orbit, my natural instinct would be to fire a thruster that would kick me forward. But that would move me into a higher orbit, so the thing I was chasing would soon drop below me. Everything we knew down here was going to be wrong up there. "I won't tell you why the main character in Anathem was headed into space, just in case you want to read the book.... it's a great adventure story! Apollo 9's command and service modules, docked. 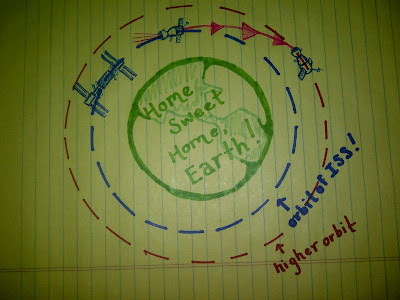 Aside from PhD dissertations and science fiction, the practical result of the orbital paradox is as follows. When the International Space Station docks with a Soyuz, the Soyuz and the ISS begin their final docking maneuvers at the same altitude and velocity as each other, but with the Soyuz out in front of the ISS. Then the Soyuz will fire its rocket and move towards a slightly higher orbit, because this slows the craft down! Next, the Soyuz will slowly drop back to the lower orbit, moving faster and closer to the ISS the lower it gets. Finally, the spacecraft will back into the ISS, docking with the front of the space station. See how the Soyuz fires its rockets so that, if it wasn't in orbit, it would move directly away from the ISS? But since both craft are in orbit, the effect of thrust in that direction is to move the Soyuz to a higher, slower orbit. Then, it can drop back down towards the ISS. Teaching folks how to achieve orbital docking by sight is not Dr. Aldrin's only academic contribution to space exploration. There's also Dr. Aldrin's novel idea for exploring Mars, called the Mars Cycler. More on that, coming soon! Sources: Scientific American; buzzaldrin.com; Neal Stephenson's Anathem; Wikipedia.